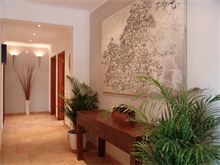 We are very pleased to be able to offer this great property which is a firm favourite with our guests. 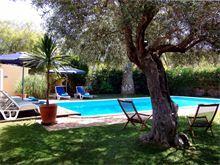 Situated in Vale d'Eguas yet just a few minutes drive from Almancil, Quinta do Lago and Vale do Lobo with Vilamoura no more than 10 minutes away by car. The interior is modern with the colours and fabrics having been carefully chosen to give a relaxing atmosphere throughout. The spacious lounge offers comfortable seating and access to the open plan kitchen with black granite work tops and stainless steel accessories. Original art adorns the walls throughout the property and is sure to provoke discussion amongst guests, but finishes off the theme perfectly whilst reflecting the owner's taste. Patio doors from the lounge lead to the pool terrace, barbecue and garden with mature shrubs and trees, the garden is totally enclosed and the high wall provides privacy from the road. Approximately 8 kms from the beach and 3 kms from the shops. Entrance into hall, large open plan kitchen/sitting room with TV, CD/DVD player, large fridge, washing machine, dryer, dishwasher and microwave. 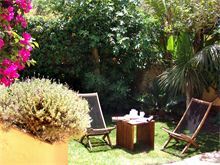 French windows lead from the lounge area to a covered terrace with dining furniture and the pool with barbecue area. 1 twin bedroom, 1 shower room, 1 twin bedroom with shower room en suite, and master double bedroom with full bathroom en suite, walk in shower, and doors to a patio. Maid service 2 times per week. 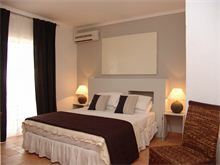 Air conditioning, pool heating and WiFi are available at extra cost if required. Lovely villa with large open plan living area. Superb kitchen with great fitting. 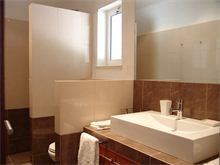 Three bedrooms with modern en-suite bathrooms and third bedroom is across from the communal bathroom. So really each bedroom has a bathroom. Great pool with sun all day. Sunken decking area which would be ideal to keep younger kids in shade and away from pool. Really a nice space with good features and fittings and very secure with full electric shutters. Excellent facilities. 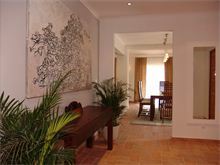 Easy access to supermarkets, beaches and other attractive areas in the area. Highly recommend the villa! 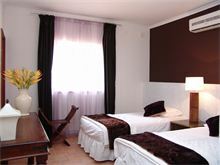 Wonderful indoor and outdoors (facilities, pool, wi-fi etc). Super service provided by the house manager, who was so friendly and helpful which we very much appreciated! Amazing villa, fabulous for families as all open plan. Facilities in the villa were fabulous... had everything we needed! Like home from Home.... topped by a fabulous pool and gorgeous weather! Love Portugal.... Love Affinity Villas!!! A perfect villa for small groups with an excellent pool and safe and secure for kids. 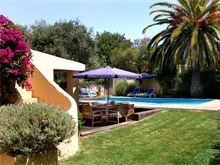 2 mins drive from supermarkets and 10 mins from Vale Do Lobo. Stayed there a number of times now. Stayed at villa in 2017 came back for more this year. Excellent! Villa and pool/garden area excellent. 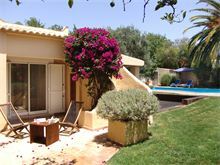 First stay at this villa, had a good enjoyable holiday, plenty of outdoor space, ideal for a family, would book again! Again,excellent stay, we love the pool area! A difficult property to show externally hence the photographs do not do this villa full justice. 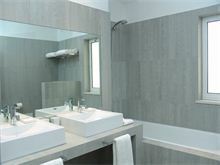 All the facilities that you would wish for and complete privacy. We have been to Casa Oleandra two years in a row and have loved our holidays there. Stunning beaches nearby to visit in the morning and the perfect pool for the whole family to enjoy for the whole afternoon. 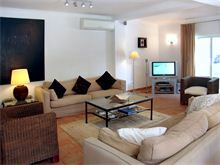 Nice villa, bathrooms excellent, lounge and kitchen excellent, garden nice and pool was great. Nice lemon tree in the drive full of big lemons. Short drive to Almancil (5mins) with two supermarkets - Aldi plus a great one called Apalonia full of fresh produce. Plenty of places to eat. 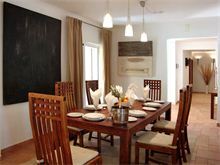 Villa was spacious and comfortable for our whole family of 5. We enjoyed the pool during the day and the relaxing environment of the open plan living area in the evening. 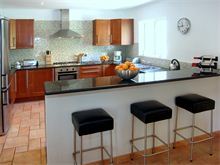 A very well laid out Villa with plenty of space for up to 6 people, with 2 en-suite bedrooms.